Maybe you’ve wondered how someone could be an Accidental Locavore and not have pages and pages of recipes for winter squash. It’s pretty simple. While an occasional serving of squash is fine for the most part, it’s around way too long (seasonally) and not terribly interesting. An occasional bowl of soup or a simple roasted preparation and I’m good until the asparagus comes up. But since it wouldn’t be fall without a bowl of soup, here’s the one winter squash recipe I come back to time after time. Serves 8 and the hardest part is peeling the squash. Since you’re going to be pureeing it at the end, chopping skills aren’t critical here. Melt the butter in a large pot over medium heat. Add onion and garlic and sauté until tender, about 10 minutes. Add broth, squash, thyme and sage, bring to a boil. Reduce heat, cover and simmer until squash is very tender, about 20 minutes. 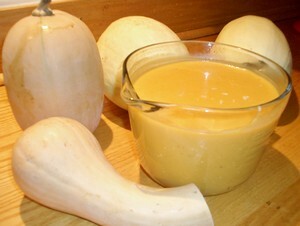 Puree soup in blender, food processor or with a stick blender (use a deep pot) in batches. Return soup to pot. Stir in cream and sugar, bring to a simmer. Taste and season with salt and pepper. For the garnish: Preheat broiler. Butter 1 side of each slice of bread. Arrange bread, buttered side up on a baking sheet. Broil until golden, about 1 minute. Turn over. Sprinkle with cheese, thyme and sage, salt and pepper. Broil until cheese melts, about 1 minute. Ladle soup into bowls, top with croutons, serve and enjoy! 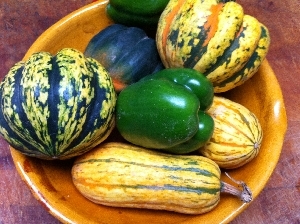 My verdict: Most squash dishes are too sweet for me. The croutons save this from being overly sweet. If I’m feeling lazy, I just toss some store-bought croutons in the soup and sprinkle some grated cheese over it. You can also do a couple of bread slices at a time in a toaster oven. Generally I use Gruyere, but a pepper jack or even some crumbled blue cheese would be fun. I’ve also been known to add a dash of Sriracha or harissa into the pot to give the soup a little kick. This soup looks delicious and just reading the recipe makes my mouth water. Can’t wait to try it! Fantastic! I have a Sweetie Pie pumpkin on the counter… soup! Next post: Soup-A-Bowl: A Fun Fundraiser!